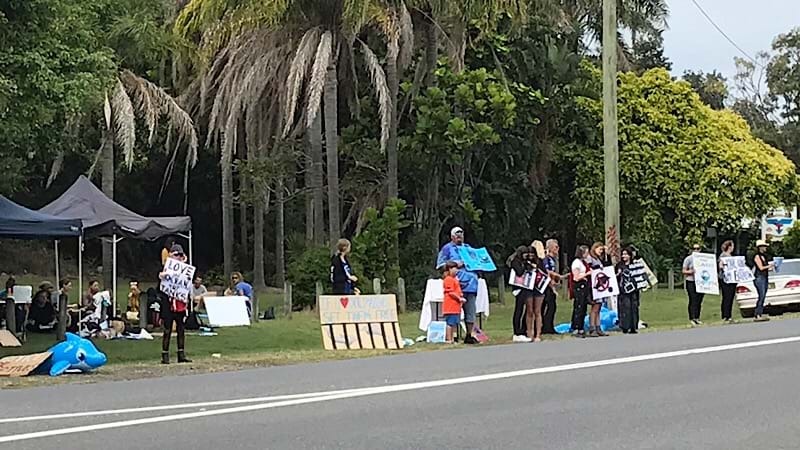 A global day of protest against dolphins in captivity has had very little interest on the Coffs Coast compared to previous years. The annual 'Empty the Tanks' protest saw very few people turn out at Dolphin Marine Magic. Support for the protest was lucky to see 30 people turn out at lunch time on Saturday, with more people interested in attending the local marine attraction and the car show put on in the car park. NSW Empty the Tanks organiser Angela Banovic said, "this is the 4th annual Empty the Tanks protest that we have organised at Dolphin Marine Magic". "We will continue to protest until those dolphins and seals are retired and transitioned into an ocean sanctuary" Ms Banovic said. Earlier in the day Ms Banovic broadcast her disappointment with the Marina Park for putting on a Car Show in the car park, as well as a BBQ for the locals for 'cooking dead animals'. Locations in Australia include QLD and NSW, along with other worldwide locations including the USA, Canada and South Africa.